I just felt the need to post this. My husband made a new collar for our dog, Fuego. He started with a survival bracelet. He deconstructed it and taught himself how to make it and then made it double-wide because Fuego is a giant dog, or, as my mom puts it, a miniature horse. On the left, we have the finished product next to a store bought collar. On the right, we have a dog that is such a camera hound that we could barely get her to hold still long enough to get a picture of her wearing the new collar. I think I finally got my fabric together for the Supernova Quilt-a-long...at least I hope that I do, because the cutting instructions become available tomorrow! Whew. Talk about waiting until the last minute. I know, right? The pictures aren't great, but the background is going to be a navy blue with an accent og the light blue. All the asterisks will be made from the coral, pink and orange fabrics. Okay. So I went on my first 4 day retreat that was far enough from home that I wasn't going back to get anything I forgot. It was great. I got so much done! I completed the middle of 2 different quilt tops. They both still need borders, of course, but here is a sneak peek. A North American Mystery Series quilt from at least a year ago...maybe 2? I'm pretty sure it was Japan. My goal is to get the borders on in the next couple of weeks. I'll get better photos and show you the whole quilt then! I have so many mystery quilts in various stages of completion. I think I need to complete them (at least the tops) before I start on the many new projects that are on my 'to sew' list. I have decided to start my blog. I have also decided to join my first quilt-along. Fortunately, the two have coincided. 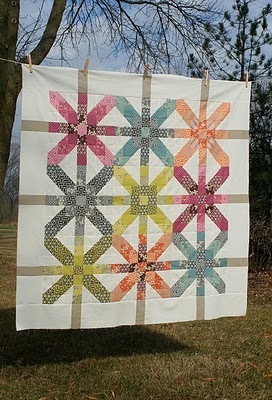 :) The quilt-along will be to make the Supernova Quilt featured (and designed by) Lee over at Freshly Pieced. Check out her blog and then join in the fun!